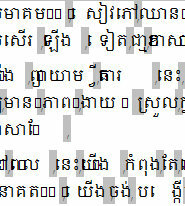 Are Khmer Unicode characters displaying incorrectly in OpenOffice? When you use a Khmer spelling checker do squares show up intermingled with Khmer script? The problem is the default GUI font does not contain all the characters of the Khmer Script. 1) To fix the display problem go to Tools>Options…>OpenOffice .org>View and uncheck “Use system font for interface”. 2) Then go to Tools>Options…>OpenOffice .org>Fonts and check “Apply replacement table”. Type “Andale Sans UI” in the box under “Font” (it isn’t in the list) and then select a font that contains a full Khmer character set under “Replace with” (we recommend using the Khmer SBBIC System font). 3) Click the green tick mark. Then (if needed) re-boot OpenOffice and it all should look great! Also, if you see gray spaces between words (they are non-breaking spaces), just click on the “View” menu and choose “Field Shadings” to disable them (or Ctrl+F8). yes this helped greatly. Just a little annoying on this end.. looking at all those boxes between words.. Were you able to get rid of the boxes between words? I am having a terrible time trying to use Khmer in open office. I think I did everything that you have suggested here, but I still get​ មោ instead of the way it should look. Do you have any suggestions about how to fix this? Many thanks. I’m using Microsoft Office 2010 (English Version), I wonder that the Khmer Spelling Check work with Ms. Office or Not. If not, when will it exist. At this time we do not have a spelling checker that works with Microsoft Office – we hope to have one in the future, but I cannot say when it will be available. I have been using khmer unicode for quite sometime on both window and mac. Recently, I changed my macbook to a new released with mac os sierra. After I dowloaded unicode for my macbook, I had encountered with the problem. Whenever I typed ា ុ ូ all these alphabet, there is going to be a box next to its. Except from microsoft office, other application such as Pages, notes, browser are doing fine. Any solution?